The A-11 offense: Ridiculous, or genius? Let us now imagine something truly absurd. Let us presume that the game of football, as we know it, is in fact in the early stages of its evolution, and that in 100 years the games we watch on our virtual-reality headsets while riding in our Chinese-made hovercars will bear no resemblance to the slogging mass of oversized bodies and three-car pileups we witness on the football field today. Let us now imagine a world with two quarterbacks on the field at once. Piedmont is playing an offense unlike anything you've ever seen. Several months ago, Steve Humphries dared to envision such a thing. Humphries is the director of football operations at Piedmont (Calif.) High School. Along with the school's head coach, Kurt Bryan, he was in the process of designing an offense that would allow Piedmont to compete against the other schools in its division, most of which have much larger enrollments, and are therefore much larger, period. Their first thought was to design an offense that consisted entirely of trick plays. They called it the Pluto Offense. It was ridiculously complex -- which is not surprising, given that Humphries is a Cal-Berkeley graduate, the type of guy who diagrammed every single play in the 2007 BCS National Championship game between Florida and Ohio State because he was obsessed with Urban Meyer's play-calling strategies. In the midst of all this planning, Humphries thought: Why not play two quarterbacks at the same time? And so the A-11 offense was born. I am the farthest thing from an expert on football strategy, but here is what I can tell you about the A-11: It is one of the weirdest things I have ever seen. What's weird about it is that it violates all of our basic instincts about the game, those noble truths we gleaned from John Facenda about the game being won in the trenches by men the size of water buffaloes. It shouldn't work, and yet it does. The A-11 is the spread offense, evolved to its most advanced stage. On film, the A-11 often resembles a hybrid of the spread and an elementary-school fire drill gone wrong. Here's how it works: On every play in the A-11, there are two quarterbacks in the backfield at one time, both set up seven yards behind the line of scrimmage. Every man on the field wears a number that potentially makes him an eligible receiver. Potential receivers set up in "pods" at each end of the field. The line, in the base set, consists of two tight ends and a center. Once the ball is snapped, up to six players (including both quarterbacks) become eligible receivers. All of this is legal because technically, according to the rules of high-school football, the Piedmont players are lined up in what is known as a "scrimmage kick" formation (hence, the quarterbacks placed seven yards behind the line, so as to comply with the rules), and therefore, normal eligibility issues do not apply. 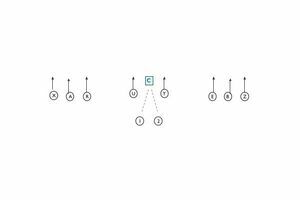 In this diagram, let's say (X, R, U, C, Y, E, Z) step onto the line of scrimmage. This gives you seven players on the line of scrimmage, making it a legal formation. On every play, the possibilities are virtually limitless. Draws, wedge plays, screen passes, the run-and-shoot, the option -- all of them can be employed, depending on how the defense reacts and on how your own players execute blocks in the open field. Of course, this also means that the field is spread precariously thin, and you'd think this would allow several extremely angry linemen and linebackers to respond to such cuteness by blowing through and decapitating one or both quarterbacks. But when Piedmont implemented the A-11 last season, that didn't happen. It is true that they lost their first game of the season, 31-2, and it's true that they lost their second game, 15-7. But they then won seven straight before losing in the first round of the playoffs, and they did all of this while facing nine different defensive looks meant to counter them. The central notion of the A-11, according to Bryan, is that the ball is always faster than the man -- therefore, spreading the field negates the speed and size of opposing defenses. If they send the house, you can even lateral from QB1 to QB2 (and QB2, if still behind the line of scrimmage, could throw downfield). It confuses defenses, and it makes them think, and we all know there has never been a defensive coordinator anywhere who has advocated thinking. It's not that Humphries and Bryan have abandoned the fundamentals altogether; it's just that they've stretched the notion of what the fundamentals are. "There's an incredible amount of method to our madness," says Humphries, who has been careful to emphasize the importance of utilizing not just the edges of the field, but the middle, between the hashmarks, as well. On staff is a martial-arts coach, who has taught Piedmont players the difficult skill of blocking in open space, using pressure-points and other hand-to-hand combat techniques. It is, of course, too early to say whether the A-11 will change football as we know it at the college and pro levels, or if it will soon be relegated to some dank graveyard of absurdist football innovations, alongside Mouse Davis and He Hate Me. On certain Internet message boards, among officials and coaches, skepticism is rampant. There are 10 different types of options in the A-11 offense (triple, crack, fly, jab, yo-yo, etc). 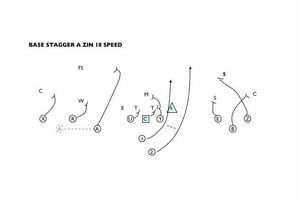 In this play the A-11 staggers the QBs, short snaps and runs a quick hitting "speed" option on the end. 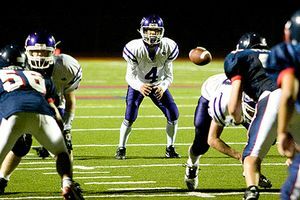 "Those people are part of a loud minority that believe the game of football should not change anymore," says Bryan, who claims that he used the shotgun formation once in the previous two decades before converting to the A-11. "And that's not being true to the long history of the game. The game must change, or it's doing a disservice to the founding fathers of history." It should be noted that Bryan has a vested interest in spreading such lofty hyperbole. He and Humphries have a deal with American Football Monthly magazine to market videotapes ($39.95 each) and an installation manual ($199). And while both insist they're not making enough money to quit their day jobs (Humphries is a mortgage consultant, Bryan an insurance broker), the attention has clearly delighted them. (For the record, Humphries says he would not turn down a job offer if Urban Meyer called.) But there remain questions of both will and practicality. At the moment, thanks to the NFL's neo-Fascist rulebook, it would be almost impossible to implement the A-11 on the professional level. But on the college level, there is a loophole -- a rule permits a scrimmage-kick formation if "it is obvious that a kick may be attempted," opening up the A-11 for use on certain situations, such as 4th-and-short or in goal-line sets -- up to, say, 10-12 times per game. Bryan said he expects up to 70 college programs (and up to a couple thousand high schools) to implement some form of the A-11 into their offense this season. Among those who have contacted him was "an extremely well-known coach in Texas," which I'm assuming was either Texas Tech's mad genius, Mike Leach, or Eric Taylor from "Friday Night Lights." "If teams use it, then it's going to be at an important moment in the game," Humphries says. "And if we start seeing it on 'SportsCenter' highlights, then a couple weeks down the road, you might see more of it happening." Of course, there is also a larger philosophical question here, one that goes back to our inherent notions about the game of football itself. The dominant paradigm has always tended toward conservatism; in the previous century, it took several decades for the forward pass to gain acceptance. Change is frowned upon, even as it is surreptitiously embraced by coaches, who will plagiarize almost any scheme that might potentially save their jobs. Even now, the spread offense is viewed by many as a fad, a temporary hiccup in a game that has always been governed by Lombardi-esque mantras involving clouds of dust and defense winning championships. But here's a striking thought: What if this is truly, inevitably the future of football we are witnessing (albeit in a still-imperfect package)? Is this acceptable to the masses? Or is part of the beauty of football in its inherent stodginess, in the image of a 240-pound fullback plowing into a pile of bodies while trying to move the spheroid forward by 12 inches? The A-11 doesn't just have pods of three players on every play. The Piedmont A-11 has over 30 formations in its playbook, including this "43" formation below. 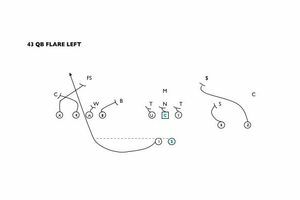 This play takes advantage of numbers and runs a QB flare pass behind a wall of players. "A lot of fans are bored by the NFL," said Humphries. "There's such a conservative and rigid set of rules that you haven't seen a lot of innovation in pro football, at least since Bill Walsh. So if this is creating a new strategy that makes the game more fun, that's a great thing. And even if this eliminates that situation of 4th-and-1 on the other team's 40, when you punt the ball into the other team's end zone -- where there's no innovation or imagination -- then hallelujah." At one point, Humphries compared the A-11 to a chess strategy, which reminded me of a different sort of mad genius. In the 1990's, Bobby Fischer invented something called Fischer Random Chess, in which the pieces are essentially set up at random at the beginning of each game, so as to emphasize creativity rather than rote memorization. Fischer was undeniably insane, but his idea has been embraced by some as the future of chess. It has also been condemned by others as the ravings of a lunatic. And while I do not know if the A-11 can challenge all our assumptions, or if it is merely a lark, I do know that it accomplishes one very important thing: It reminds us that nothing in the universe can ever remain static. Not even football. Michael Weinreb's book "Game of Kings: A Year Among the Oddballs and Geniuses Who Make Up America's Top High School Chess Team" has been released in paperback by Gotham Books. He is currently working on a book about sports in the 1980s. He can be reached at michaelweinreb.com.